2700-2900K warm white-yellow Mini Led Lights are so bright and they illuminate a dark corner and create a romantic sentiment. the Decor light is perfect for spice up your decoration and add welcome feelings to your party, restaurant and shops. 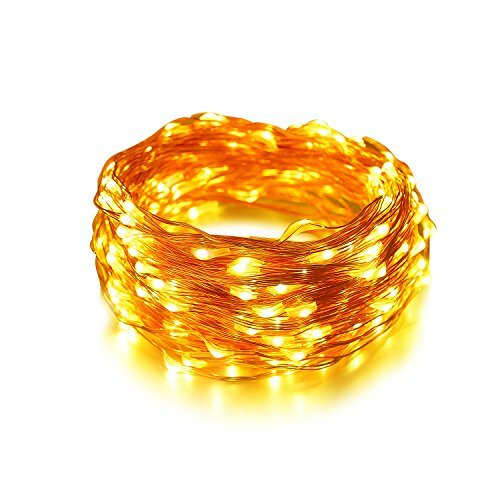 66Ft LED copper wire string lights length is more suitable for DIY effect, the low adapter for this wire string lights is guaranteed with UL. High quality copper wire that is thin and flexible , easy storage and ready for next use, reel in the string lights to keep it tidy, organized and easy to be untied.The Copper Wire Lights can be easily bended, and shaped around plants, signs, furniture and almost everything else. Universal power adapter which provide the ultimate combination of flexibility and durability for quick installation, placement, configuration and design anytime, anywhere. very easy to operate. Only the copper wire string lights are waterproof. The power adapter is NOT warterproof. Whatever the occasion, party lights make it more fun! 66 feet is a lot longer than you think!